Thanks go out once again to the regulars who post in this website's Guestbook for teaching me a great deal about the Band and all types of music on a regular basis. This piece would not exist without their knowledge and enthusiasm. I also appreciate the feedback I received from the first essay; many people wrote with additional information, reactions, and criticism which have all made this installment better as a result. Most of all, everyone in the online Band community owes Jan Høiberg a debt of gratitude for maintaining a truly tremendous website worthy in every respect of the group to which it pays tribute. The Band peaked early, as most artists do, and spent the rest of its career unsuccessfully attempting to regain the critical acclaim and relative commercial success of Music From Big Pink and The Band - coming closest with a documentary film and album chronicling the permanent dissolution of its first and greatest lineup. Combined with the usual artistic differences, ego clashes, substance abuse, tragic death, and a personal feud between two members which threatens to last substantially longer than the original group itself, these events would have sewn up an episode of VH-1's Behind the Music for the Band long ago if it had been younger or a bit more famous. In any case, few writers can approach the subject without emphasizing the mid-seventies "decline" reversed only (as the story goes) by Robbie Robertson's decision to just call the whole thing off with some friends-who-were-more-than-just-friends supervising the wake one Thanksgiving at the Winterland. Fair enough; I'm not here to argue that the Band's first two albums weren't also their best, or that the group didn't become periodically unsure of its own direction in the years that followed. But the release of the second round of reissued albums by Capitol Records affords us all an excellent opportunity for revisiting - and, perhaps, re-evaluating - the 1972-1977 period, armed with sonically superior and expanded versions of Rock of Ages, Moondog Matinee, Northern Lights-Southern Cross, and Islands. The general format of these remastered discs is identical to the first four albums reissued last August. The sound quality of each improves perceptibly, though Rock of Ages and Moondog Matinee enjoy the greatest benefits from the remastering process. Rob Bowman once again provides the written notes (much to the disgust of a certain Barney Hoskyns, apparently; who could have guessed that we would have a Liner Notes Feud to match the familiar Songwriting Credits Feud? ), with additional photos, engineer tracksheets, promo posters, 45 RPM single label reproductions, and handwritten lyrics adorning the pages of the CD booklets. Bowman's notes are a major addition to this round of reissues. Even expert Band fans who know all the ins and outs of the group's first few albums will probably learn much about the later catalogue from his research. The formats of the Academy of Music concerts are described in fascinating detail in the Rock of Ages booklet, complete with extensive quotes from Robbie Robertson and Allen Toussaint about the use of a horn section for part of the shows. (Toussaint recalls that he lost the first drafts of his horn arrangements, scored in New Orleans, when another traveler picked up his bag at the airport - forcing him to redo the parts from scratch in Woodstock just days before the first New York concert.) Bowman also reveals that the Band actually recorded some of Robertson's ambitious but unfinished Works project, though the results may well never surface, and that "Jupiter Hollow" from Northern Lights-Southern Cross was one of the first rock recordings to feature a drum machine. Most importantly, of course, our own Peter Viney is namechecked in the Moondog Matinee notes for his "excellent treatise posted on the internet"! My quibbles with the CD booklets are few and quite minor: the new Northern Lights-Southern Cross omits the track-by-track instrumental listing, the gorgeous Edward Kasper painting for Moondog Matinee has been shrunk slightly from its pre-reissue size, and the songwriting credits are occasionally incorrect, as they were in the first round of rereleases. For the record: "If I Lose" was written by Ralph Stanley, not Charlie Poole; "Don't Do It" was written by Holland-Dozier-Holland, not Marvin Gaye (as the Cahoots documentation claims) or Robbie Robertson (as listed in Rock of Ages); and "The Genetic Method" should be credited to Garth Hudson alone, not Robertson-Hudson. I may be nitpicking, but these are sloppy mistakes which could be corrected with ten minutes at the ASCAP and BMI websites. One final note: once again, the liner notes are Robertson-dominated, due to the apparent lack of participation by Messrs. Helm and Hudson. Though Robbie (despite many kind words for his ex-bandmates) too often tends to speak as if the group's entire career sprang fully-formed from his own genius, the notes are such a source of information and insight that I hope no Band fan dismisses them for this reason. Bowman reminds us in the liner notes to Rock of Ages that the modern rock concert - and, therefore, the modern rock concert recording - was actually a fairly new art form in 1971, when the Band, augmented by a five-man horn section, scheduled a series of performances at the New York Academy of Music for the purpose of cutting a live album. With the exception of James Brown's Live at the Apollo, the classic records which first established the genre - Cream's Wheels of Fire, the Who's Live at Leeds, the Grateful Dead's Live/Dead, the Allman Brothers Band's Live at the Fillmore, and the Monterey Pop and Woodstock Festival recordings - had all been released within the previous three or four years. Before that, live performances were often perfunctory affairs marred by subpar sound; Bowman correctly identifies the Dylan/Hawks tour of 1965-66, when the group traveled with its own amplification, as a significant milestone in the development of what we now know as the rock concert. By the mid-seventies, almost every artist of any consequence - and many of none - had issued a double-live set or two. The reissued Rock of Ages places the entire original album, formerly two LPs or CDs, on one disc; the second disc is comprised entirely of ten bonus tracks, including four performances featuring Bob Dylan, who was a special guest at the final show on New Year's Eve. Every song played at any of the Academy of Music concerts is now included, with the exception of "Strawberry Wine" and "Smoke Signal" (for which master tapes have apparently been lost, though they both appear on bootlegs), demonstrating the true breadth of the Band's extraordinary artistic achievement at these shows for the first time on an official release. Some of the extra material from the Rock of Ages concerts actually appeared first on the so-called Live at Watkins Glen album, a supposed document of the Band's performance at the Watkins Glen festival in 1973 which was released by Capitol in 1995. Research by Guestbook regular Pat Brennan (see the article on this site) proved conclusively that nearly all the tracks on the now-out-of-print Watkins Glen album actually derived from other sources; Pat has since determined that several "Watkins Glen" numbers were actually 1971 outtakes from the Academy of Music shows. Bowman fails to mention this curious fact in the Rock of Ages liner notes, but he does reveal in the Moondog Matinee booklet that "Back to Memphis" and "Endless Highway" from Watkins Glen were actually studio tracks with audience applause dubbed in (the unmarred studio versions have now been released as Moondog Matinee bonus tracks), and justifiably refers to Watkins Glen as a "fraudulent" album compiled without the Band's participation or approval. As mentioned above, the first disc of the reissued Rock of Ages consists entirely of the original double album, coming in just under the 80-minute compact disc time limit at 79:55. Robertson's introduction of the horn section and its subsequent tuneup have been isolated on Track 1, with "Don't Do It" moved to Track 2. Bowman notes that the album does not follow the order of the set lists for the Academy of Music shows; in actuality, the group played twelve tunes by itself each night before coming break after an intermission with horns in tow, and the second set always started with "Life Is a Carnival." But it's hard to imagine Rock of Ages without the horn-driven "Don't Do It" kicking things off - one of the Band's greatest-ever performances. The Band rolled through this Motown chestnut as a final encore at one of the Academy of Music shows. With Rick Danko's hoarse-but-warm vocal and a tight, spirited ensemble performance after what must have been a very long night, it's hard not to interpret this song as a gesture of genuine affection for the audience from a group which often cultivated an elusive and standoffish public image. Manuel and Robertson ably trade licks near the end before the three singers bring it all to a close. At the risk of committing heresy, I'll admit that I've always thought Richard Manuel's falsetto on this song to have been ill-advised, and would have loved to hear him sing it in a lower octave. This performance is indeed heartfelt and otherwise technically assured (note Robertson's sly glissando after "They say every man must fall"); only its unwavering recreation of the Music From Big Pink arrangement probably kept it from release on the original LP. This version of "Cripple Creek" is surprisingly laid-back, since the number was used to open the first set at each of the Academy of Music shows. The Band settles comfortably into the slower tempo, however, and both Helm and Danko are in fine voice. As it often did when performing this song live, the group omits the fourth verse. Generally faithful to the Stage Fright original, this rendition of Robertson's exploration of small-town life's darker side demonstrates the Band's ability to replicate a fairly complex musical arrangement in live performance. Garth Hudson's organ emphasizes the haunting lyrics, while Danko's harmonies with Manuel on the chorus add a welcome touch. 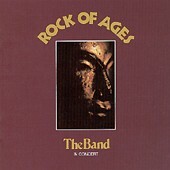 Rock of Ages revealed that the Band could perform its quietest and most difficult material ("King Harvest," "The Unfaithful Servant") on stage as expertly as it could stomp out "The Shape I'm In" or "Chest Fever." This exquisite version of "Rockin' Chair" matches the Brown Album original; if anything, the three vocalists' blend on the chorus surpasses the studio version. And the way Richard Manuel sings "I just want to get my feet back on the ground" is worth the price of the album all by itself. The Band flies through this by-the-numbers rocker enjoyably enough, driven by Garth Hudson's rollicking piano. Helm is back on drums for the live version, while Manuel plays an electric piano or organ of some kind (it sounds like the same instrument used for "The Shape I'm In"). The song is not up to Robertson's usual standards, and Danko and Manuel often can't seem to get their vocals in sync, but Danko ensures that this performance won't make the original album by flubbing the end of the second verse. No overdubbing here! In the midst of his eight-year break from touring, old pal and brother-in-arms Bob Dylan nonetheless agreed to join the Band onstage for four songs during its final New York concert. However, a small picture on the sleeve and a "special thanks" in the credits amounted to Dylan's only appearance on the original Rock of Ages. Though the Band may have omitted Dylan from the LP for contractual reasons or because it wished to establish a separate identity, the newly-released bonus tracks also reveal the guys' apparent fear that actually rehearsing the material beforehand might endanger their spontaneity. Of course, Dylan is known for ragged but passionate performances; blown lyrics, dissonant harmonies, instrumental mistakes, and are-we-going-to-end-the-song-here? guess-not-okay-well-let's-end-it-here moments have a certain charm, especially when the right feeling is present. Feeling indeed abounds on this recording, Dylan's voice is particularly strong and clear, and the song selections are mostly unusual (remember that "Don't Ya Tell Henry" was still four years away from official release) yet appropriate. But it's easy to understand why the Band decided to keep this part of the concert under wraps for thirty years or so; I can imagine Robertson in particular shaking his head as he listens to the playbacks and wonders why Bob couldn't at least have gone over the words a couple of times before walking out on stage. Apparently Dylan's only live performance of "Down in the Flood" (also known as "Crash on the Levee") until he revived it in the 1990s, this rendition of the Basement Tapes classic (also recorded earlier in 1971 with Happy Traum for Bob Dylan's Greatest Hits, Volume 2) is the best of the four songs with Dylan. The Band finds a slow, swampy groove appropriate for the setting of the lyrics, led by a Robertson guitar figure reprised - at a faster tempo - during the 1974 Dylan/Band tour as the defining riff of "Most Likely You Go Your Way (And I'll Go Mine)." Danko bellows along, trying his best to remember the words, Hudson provides his usual expert organ ornamentation, and Manuel keeps the beat behind the kit. (Levon Helm apparently either strums along inaudibly on mandolin or takes a cigarette break - after all, he was working on a Louisiana oil rig when the other guys first cut this tune up in Woodstock.) As Dylan begins his second pass through the song, the horn section - apparently enjoying the performance from the stage - begins to play along by providing quarter note accents; the saxophonists add some improvised flourishes as well. Dylan and the Band keep things loose with a reading of "When I Paint My Masterpiece" which is relaxed in tempo yet features forceful vocals reminiscent of the 1974 tour. Though Dylan again sings lead, his performance is more faithful to the Band's Cahoots version than the lyrically different take on Bob Dylan's Greatest Hits, Volume 2 - for example, he includes the "gondola" bridge missing from his own recording of the song. Helm takes over for this helplessly sloppy romp through Basement Tapes wackiness, though Dylan doesn't let his limited familiarity with one of his own compositions prevent him from shouting along. Robertson, apparently unfazed, delivers two fine guitar solos, and poor Manuel does his best to stumble along on the drums until the song finally hits the wall. "We haven't played this in...how many years?" Six years, says Robbie. "Six years, we haven't played this!" Sixteen years, says Rick. "Sixteen years!" With that introduction, Bob and friends kick into the obligatory nightcap, "Like a Rolling Stone." Actually, it's been about two-and-a-half years since they massacred the song at the Isle of Wight festival, which everyone would probably like to forget (except that Dylan kept the pain alive by preserving the proof on Self Portrait). No matter - despite the apology in advance for the inevitable lyrical mishaps (Dylan loses the thread when he gets to the mystery tramp, tries to bluff his way through the rest of the verse, and skips the next one for good measure), all six pairs of hands remember the song well, with Richard Manuel's piano standing out among the rest. By the last chorus, everyone's singing along, the horn section adds some brassy punch to the sound, and the Great Kooper/Hudson Organ Riff carries the group to its exultant finale. Though Bowman explicitly mentions Peter Viney's essay (written for this site) in the Moondog Matinee notes only in connection with the "Richard's album" nickname (which was actually coined by Greil Marcus in Mystery Train, and which Bowman proceeds, oddly enough, to dispute), he incorporates two of Peter's main points into his discussion. First, despite Robertson's implications, the song selections most certainly did not represent the pre-Dylan Hawks' on-stage repertoire; as Peter and Bowman both demonstrate, "Share Your Love" was the only Moondog track known to have been performed by the group in those days, and the original "Holy Cow" was not even released by the time that the Hawks left the club circuit to tour the world with Dylan in 1965. Second, these songs were by no means obvious choices for an "oldies" album - in fact, only the Platters' "The Great Pretender" and Anton Karas's "The Third Man Theme" - not a rock-and-roll song at all, of course - were Top Ten hits on the pop charts in their original incarnations. Robertson remembers loose, informal studio sessions with no clear concept in mind. Various members would suggest old favorites for the group to run through; those that held promise would be worked on more seriously for possible inclusion on the album. 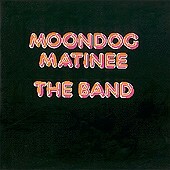 The number of Moondog Matinee outtakes surprised many Band fans when Capitol announced the second round of reissues; in addition to the five included as bonus tracks, Bowman mentions a recorded version of Faye Adams's "Shake a Hand" and, tantalizingly, thirty-four takes of Sam Cooke's "Bring It On Home to Me" with Rick Danko on lead vocal. As originally released, Moondog Matinee demonstrated the Band's love for pre-Beatles rock-and-roll and mid-'60s R & B/soul music (with "The Third Man Theme" thrown in as a curveball). 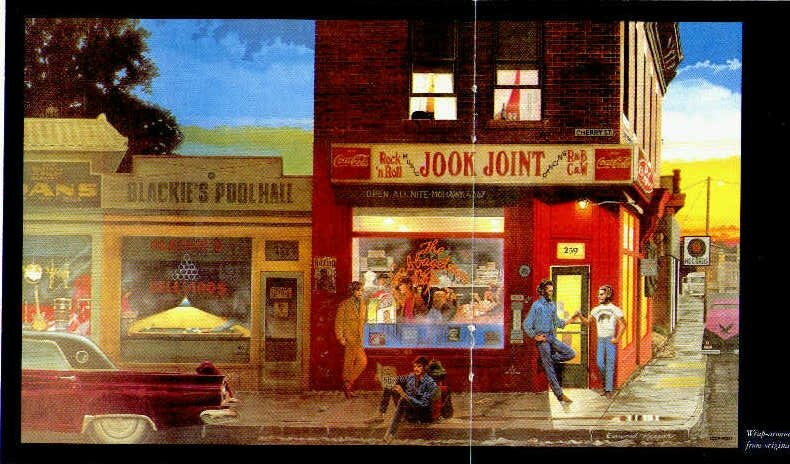 But the bonus tracks reveal a broader range: a gospel number, a country-and-western tune, a blues (performed with a funk-influenced arrangement), and a heretofore-unknown gem of a song which seems to sum up the totality of the group's influences all by itself. Obviously, the Band decided at some point along the way to sacrifice eclecticism for focus and assembled a perfectly respectable collection of performances which, while impressive enough on their own terms, still only hint at the magic which once made the Hawks the best bar band on the continent. Had it chosen, however, the group could have released an album in 1973 which more accurately reflected the truly extraordinary sweep of both its roots and its ambitions and demonstrated the Band's signature ability to create a coherent aesthetic from such a variety of musical sources. Levon Helm takes a bright and spirited jaunt through this traditional gospel tune (as arranged by Roberta Martin and recorded by Mahalia Jackson in 1953). The spontaneous feel is welcome after original album tracks which err on the side of overproduction; at the same time, the listener's imagination has to supply the fantastic backing vocals from Danko and Manuel that the Band undoubtedly could have worked up had it spent more time on the song. Who knew that one of Rick Danko's finest vocal performances has been gathering dust in a tape vault for the past 28 years? Danko turns this 1951 country hit for the duo Johnnie and Jack into a tearjerker reminiscent of "It Makes No Difference," complete with a weeping solo from Robertson and sympathetic backing from the rest of the group. Astonishingly, the Band put this take aside and moved on, declining to release it even when scraping the bottom of the barrel for Islands four years later. An obscure blues number sung by Helm which is ultimately more curious than convincing, "Shakin'" owes some of its feel to early-'70s funk, but the Band doesn't commit itself quite enough to the groove to pull off the performance completely. Hudson experiments with string and flute sounds on his keyboards, despite their limited applicability to the style of music attempted here. With Danko and Manuel absent from the session, the three remaining Band members lay down a stunning version of R & B singer Chuck Willis's "What Am I Living For" - the B-side to "(I Don't Want To) Hang Up My Rock And Roll Shoes" (covered on Rock of Ages) and, chillingly enough considering the title and sentiment of the song, a posthumous release for Willis, who died in 1958 at the age of thirty. Robertson's strummed acoustic guitar, Hudson's subtle, mournful organ, and Helm's pulsing standup bass set the backdrop for one of Levon's most authentic and moving vocal turns on record. With this performance, the Band transcends mere genre classification, as it always did on the very best of its work, fusing elements of country, blues, folk, rock-and-roll and God-knows-what-else into a sound uniquely its own. Though a string or two on Helm's bass can't quite stay in tune, this imperfection detracts not a hair from appreciation of the group's achievement here; "What Am I Living For" is the most revelatory - and quite simply the best - of the bonus tracks added to any of the eight Capitol reissues. Another Chuck Berry cover which the Band ultimately dropped from the original Moondog Matinee album in favor of "The Promised Land," this version of "Going Back To Memphis" (or "Back To Memphis" as it was heretofore known) first surfaced on various Capitol compilations as well as the Live at Watkins Glen disc, despite being neither (a) live nor (b) from Watkins Glen. Now that the fake audience noise has been sheepishly removed by the Capitol production team, we are free to enjoy a tour-de-force instrumental performance as the group meant us to hear it, with Helm in particular impersonating a speeding locomotive behind the drum kit. Before the Capitol reissues, it was not generally known for certain whether the Band recorded a studio version of this song, released in live form in 1974 on Before the Flood. As it turns out, the group took a crack at it at least twice: the remastered Cahoots disc included an early take featuring Richard Manuel on lead vocal, and now the new Moondog Matinee includes the more familiar Rick Danko-led arrangement (though it seems a bit out of place here as the only Band original among a series of cover songs). In fact, this take is "more familiar" in more ways than one, as it was also tampered with and churned out on Live at Watkins Glen. All in all, it's a perfectly serviceable performance, though less energetic than the Before the Flood cut. 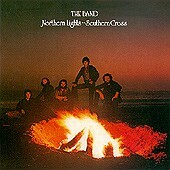 Either the original Band's final triumph in the studio or a demonstration of its eroding inspiration, Northern Lights-Southern Cross seems to provoke more disagreement in this website's Guestbook than any other album. Bowman argues that the disc is one of the group's stronger collections of songs (including three masterpieces: "Ophelia," "Acadian Driftwood" and "It Makes No Difference"), which I would not dispute, though the later Band's extensive reliance on overdubbing and synthesizers certainly dates the sound of the album and removes some of the freshness from the performances. The remastered Northern Lights-Southern Cross restores the original running order for the final three tracks, which had been rearranged for the first CD release. A demo featuring just piano, bass and drums, with Helm taking the lead on the choruses, this slower take easily wins out over the ill-advised single version, though Robertson is clearly in the intermediate stages of revising the lyrics. The definitive recording of this song remains the performance on Danko's Live on Breeze Hill. Danko, Robertson and Helm spin through an uptempo reading of this song, seemingly just to get it down on tape (since the sentiment of the words clearly dictates a more measured arrangement). At one point considered for a Christmas single release, Robertson's "modern carol" (to borrow Peter Viney's phrase) was ultimately consigned to Islands, where it became a highlight of an otherwise uneven album. Bowman encourages fans to consider Islands an odds-and-ends/rarities collection rather than a coherent studio album; Robertson concurs, adding, "Right now if somebody put out an album of B-sides and outtakes, everybody would say 'Right on.'" 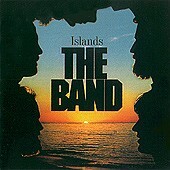 Knowledge of the circumstances surrounding its preparation certainly aids in understanding Islands's haphazard quality - the group needed to throw one more album together to fulfill its Capitol contract before starting work on the Last Waltz project for Warner Brothers - but may or may not, I suppose, actually affect one's judgment of its artistic merits or propensity to pull it out and play it. Though Islands contains a few hidden gems, and may well be a more enjoyable album overall than Cahoots, only the excellent and underappreciated "Last Waltz Suite" released the following year demonstrated that the Band hadn't lost its magic touch in the studio for good. One of the better songs from the later era, though the lyrics seem somehow unfinished, "Twilight" was recorded with a comically inappropriate reggae arrangement during the Northern Lights-Southern Cross sessions and issued as an obscure single after the album's release. It ended up somehow on The Best of the Band, probably to encourage completists to purchase the compilation as well. Fortunately, Rick Danko revived the tune in his later career, recording it several times with markedly better results. This outtake of "Georgia On My Mind" differs little from the original Islands track. For all of Richard Manuel's emoting on the vocal - and I agree that he oversings here - he obviously means quite deliberately and sincerely to convey his love for the music of Ray Charles and the other great soul singers. Perhaps the superior performance on Saturday Night Live or the outtake from The Last Waltz will someday see the light of day. These four albums document the direction that the Band turned when that first burst of inspiration wore off forever. Never again would the group reach the heights of The Band; never again, too, would it allow itself to overreach and fall so short as on Cahoots. Though the declining interest and mounting personal problems of certain members, added to often-strained internal relations, would prevent the magic of the early years from reoccurring, the raw talent and musicianship of these five men would also forestall a decline into bland mediocrity. These remastered albums, with their supply of additional tracks, allow us to develop a new appreciation for those moments in the group's later career when it was able to recapture the spirit of what had first made the Band so special.